Icaro Farre has just updated CV Toolkit, and it is a doozy. Version 2.6 has a feature I begged for in my Cycling newsletter review: input handling. Now, your CV inputs (from an ES-8 or ES-6) can be used as modulation sources within CV Toolkit, and you really have round-trip, fully-hybrid computer/modular interaction. It's amazing to see things that I'd dreamed of decades ago coming together before my eyes. Makes me wanna cry or something. But instead I'm just going to be jammin' with the modular! So, if you read my latest Cycling '74 review, you'll know I'm pretty knocked out by the Expert Sleepers' ES-8 interface. Of course, I had to start coding for it as soon as possible. 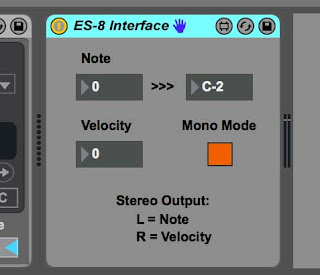 While I'm doing all sorts of stuff within Max (as described in the article), I'm also using it as my modular interface from Ableton Live. 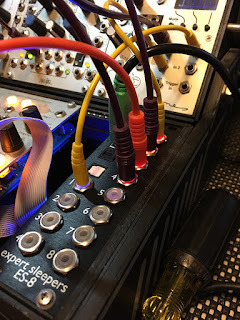 So, rather than just keep it to myself, I quickly slapped together a Max for Live device that uses the same technique as in the article, but also provides a 'mono mode' to properly handle note allocation within a monophonic modular context. The result is the simplest direct CV way to interface a modular to Live (i.e., no MIDI-to-CV devices, no scaling or calibration hassles). I did three tracks with this over the weekend, including part of the theme music for the weekend's podcast (with Joshua Eustis of Telefon Tel Aviv). Completely solid, man!